An online guide for the college Institutional Review Board. Remember to be in early contact with the LaGrange College Institutional Review Board if your research will involve human participants. Your project must be reviewed by the college IRB before data collection begins. A good tutorial on IRB policies in general can be reviewed at (University of MN). 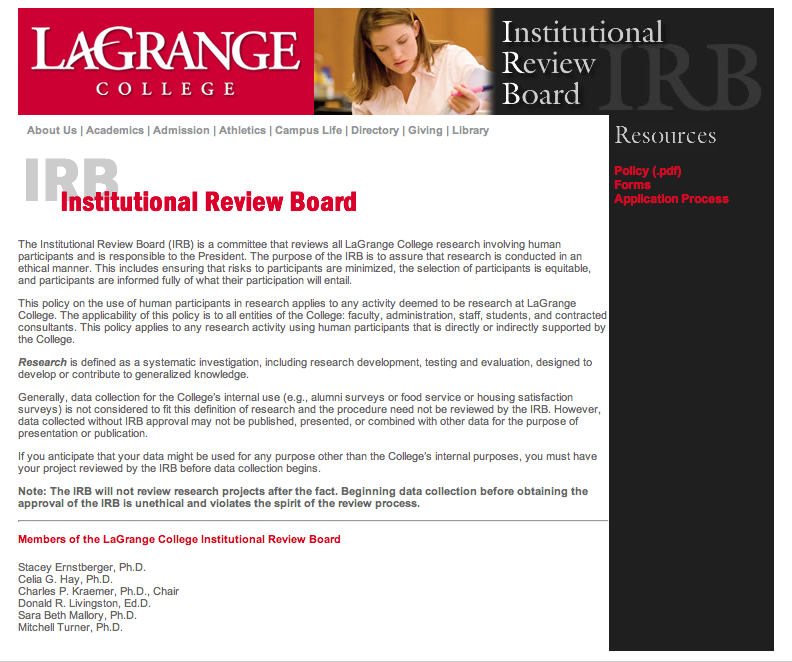 The Institutional Review Board (IRB) is a committee that reviews all LaGrange College research involving human participants and is responsible to the President. The purpose of the IRB is to assure that research is conducted in an ethical manner. This includes ensuring that risks to participants are minimized, the selection of participants is equitable, and participants are informed fully of what their participation will entail. This policy on the use of human participants in research applies to any activity deemed to be research at LaGrange College. The applicability of this policy is to all entities of the College: faculty, administration, staff, students, and contracted consultants. This policy applies to any research activity using human participants that is directly or indirectly supported by the College. Research is defined as a systematic investigation, including research development, testing and evaluation, designed to develop or contribute to generalized knowledge. Generally, data collection for the College’s internal use (e.g., alumni surveys or food service or housing satisfaction surveys) is not considered to fit this definition of research and the procedure need not be reviewed by the IRB. However, data collected without IRB approval may not be published, presented, or combined with other data for the purpose of presentation or publication. If you anticipate that your data might be used for any purpose other than the College’s internal purposes, you must have your project reviewed by the IRB before data collection begins. Note: The IRB will not review research projects after the fact. Beginning data collection before obtaining the approval of the IRB is unethical and violates the spirit of the review process.